Edible experiments with 3D printing continue to expand the range of customized food available to consumers. We recently reported that Kinneir Dufort in the UK can now produce pancakes with the diner’s face on, and now Dutch supermarket Albert Hejin is enabling customers to design, print and buy custom cake decorations. The company is running a pilot at its new Eindhoven superstore which enables customers to create their own designs using Doodle3D. The illustration program is running on a tablet in their confectionary department — customers simply create a custom cake decoration on the screen and, once finished, the software converts the digital drawing into a 3D printable model. It is then sent to a byFlow 3D printer. ByFlow is a portable food printer designed by dutch design student Floris Hoff which folds up into a self contained briefcase, making it one of the most portable 3D printers to date. The printer extrudes molten chocolate — either Nutella or melted white and dark chocolate — onto the supermarket’s ready-made bakery products. 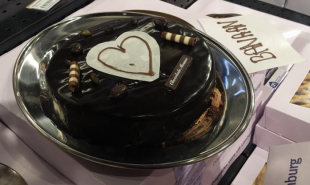 Since the paste-like chocolate sets almost immediately, customers can have their personalized cakes made while they wait and take them home with the rest of their shopping. If the pilot scheme is successful, Albert Hejin hope to offer the service in 30 more stores by the end of the year. What other custom food products could supermarkets offer?